The Official 2006 Game Football of the NFL. Return of the classic Duke pattern ball. Designed for the serious competitor/professional. The top of the line leather game ball designed for the highest level of competitive play. For the elite player – a great ball for the serious fan or collector. Tanned-in tack is the built in tackiness that keeps the ball gripable after extended use. Patented 3-ply VPU bladder made in USA to provide the best durability and air retention in the market. 3 layers of lining are hand stitched to the football panels to allow the ball to maintain its shape. Lockstitch construction is a Wilson guarantee that each stitch is independent of the other-pulling a thread will not unravel the seam. Double-lacing reinforces and raises the laces for enhanced grip when passing. 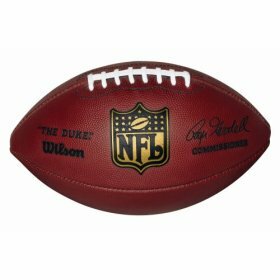 Wilson has been the Official Football of the NFL since 1941. No other manufacturer has been able to match the Wilson tanned-in tack process. The Wilson NFL football pattern is the choice of professional football players.